Delores Mae (Kistner) Jochum, 86, of Glencoe, died Saturday, June 11, 2016, at her daughter’s home in Glencoe. Honorary casket bearers were Mrs. Jochum’s grandchildren. Casket bearers were Greg Bemboom, Tracy Christensen, Chad Karg, Kristal Ehrke, Peter Wagman and Josh Karg. Interment was in the Glencoe Catholic Cemetery. Delores Mae (Kistner) Jochum was born Dec. 14, 1929, in Arlington, the daughter of Fredrick and Wilhelmine “Minnie” (Laabs) Kistner. She was baptized as an infant on Dec. 26, 1929, by the Rev. Robert Heidmann, and was confirmed in her faith as a youth on April 2, 1944, by the Rev. John Bradtke, both at St. Paul’s Lutheran Church in Arlington. She was educated in Arlington, graduating with the Arlington High School class of 1948. On Nov. 24, 1949, she was united in marriage to John Edward Jochum by the Rev. Albert A. Slechta at the reverend’s home in Glencoe. The couple made their home on a farm south of Glencoe. In 1987, after her husband’s death, Mrs. Jochum moved to Glencoe. Their marriage was blessed with five children, Barbara, Mary Ann, Bonnie, Betty and Marilyn. The couple shared over 34 years of marriage before Mr. Jochum’s death on Sept. 13, 1984. In addition to being a loving wife, mother and homemaker, Mrs. Jochum helped her husband on their dairy farm, worked at Green Giant in Glencoe and at Hutchinson Technology, Inc., in Hutchinson. She was a member of the Church of St. Pius X in Glencoe, where she also was a member of the Council of Catholic Women and enjoyed quilting at the church. She belonged to the Senior Citizens Club and various card clubs. She was a hard worker, very social and always made others feel welcome. She enjoyed baking, decorating for every holiday, loved flowers, and made sure she had dessert on hand for anyone who stopped in. 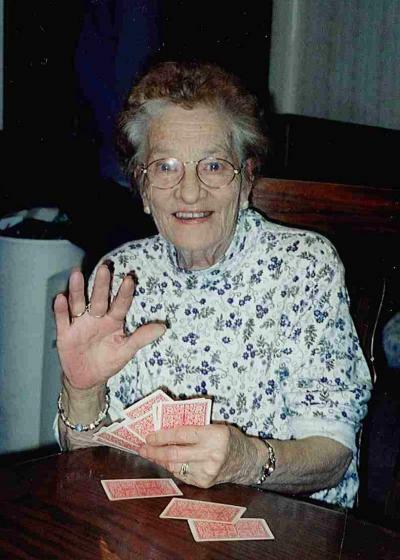 She loved to play cards, especially 500. She cherished the time spent with family and friends. She is survived by her daughters and their husbands, Barbara and John Bemboom of Sauk Rapids, Mary Ann and Paul Christensen of Glencoe, Bonnie and Alan McLain of Hutchinson, Betty and David Witthus of Glencoe and Marilyn and Greg Wagman of Chaska; 22 grandchildren; 37 great-grandchildren; sister and brother-in-law, Cordella and Maynard Husfeldt of Gaylord; brothers-in-law and sisters-in-law, Leo Jochum of Glencoe, Kitty Jochum of Glencoe, Teresa and Carl Esslinger of Mendota Heights and Jarlath Datt of Orange, California; nieces, nephews, other relatives and many friends. She was preceded in death by her parents, Fredrick and Wilhelmine “Minnie” Kistner; husband, John Jochum; brother and sister-in-law, Orville and Luella Kistner; infant brother, Merle Kistner; parents-in-law, Anthony and Nellie Jochum; and brothers-in-law and sisters-in-law. Arrangements were with the Johnson-McBride Funeral Chapel in Glencoe. Online obituaries and guest book are available at www.hantge. com.